﻿ FIB - Great audience in Vänersborg final! 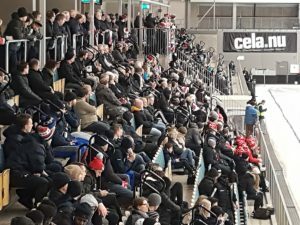 Great audience in Vänersborg final! A big audience saw the final of Group B between Estonia and Great Britain. The organizers rated the audience to approximately 1050 persons. Many fans from Great Britain raised the moods in Arena Vänersborg. Estonia won the Group B-final 9-3.